a. 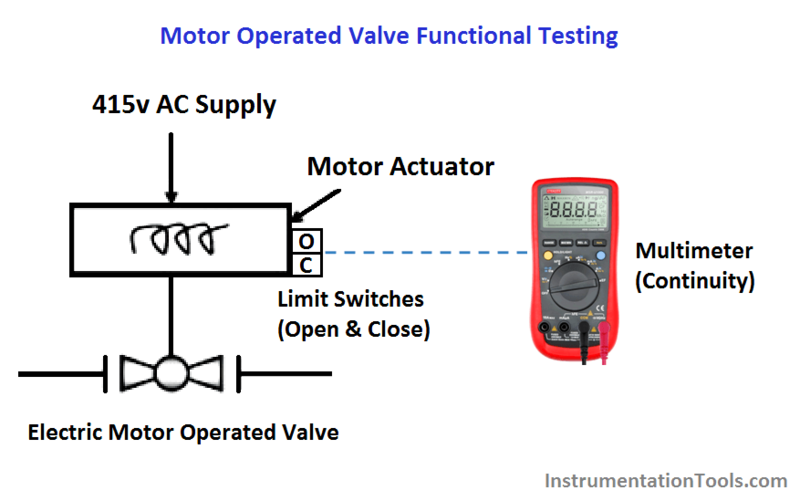 Check motor spec as per datasheets. b. Check motor winding insulation resistance and record it. c. Hook-up instrument as per typical set-up. d. Confirm valve fail position (AFC/AFO). Switch on power supply and check voltage and phase sequence. e. Set the L-O-R selector (Mode Selection) to ‘LOCAL’ position. f. Press the ‘OPEN’ button and confirm the valves opens. Verify valve position indication. g. Check the limit switch for ‘OPEN’ position. Limit switches contact to be adjusted to actuated at around 95% of valve stroke. h. Press the ‘CLOSE’ button and confirm the valve doses. Verify valve position indication. i. Check the limit switch for ‘CLOSE’ position. Limit switches contact to be adjusted to activate at around 95% of valve stroke. j. Set the L-O-R selector (Mode Selection) to ‘REMOTE position. m. Record stroking time from Open to Closed and Closed to Open.